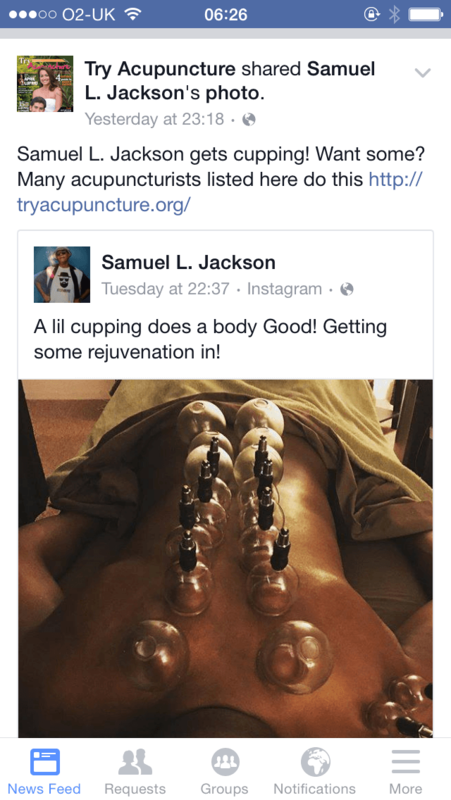 Acupuncture That Works Cheshire › Posts Tagged "cupping"
After a summer of up and down weather your body may be left feeling slightly unbalanced. In these times most people would look to see how many more vitamin supplements they can find to take but unsurprisingly, this isn’t the answer. When it comes to your body feeling unbalanced why not try looking at more traditional methods such as acupuncture and cupping. Cupping is a treatment that has blown up over the summer after Olympic athletes and celebrities have been seen with the marks of the cups all over their bodies. In this article we will be discussing what this unique treatment is and the ways in which it works. In some respects, cupping is similar to a massage in the sense that pressure is still being applied but it is being sucked up through the cups. These cups are usually made of either glass, plastic or more traditionally, bamboo and works by creating an air vacuum that suctions out the air. This pressure that is then created pulls your skin, underlying tissue and muscles upwards and holds it. Often this treatment is coupled with Traditional Chinese Acupuncture treatments to complement its effects, but is not always necessary. The purpose to all of this is ultimately to help improve circulation in your body, relieving any pain that has built up in certain areas and remove any toxins that are trapped. What is involved in a Cupping session? During the treatments, patients will often feel a tingling and tight sensation in the area the cup is placed but this can be quite therapeutic and relaxing. If it does become slightly uncomfortable your practitioner won’t hesitate to remove the cup. The amount of time that the cup is generally left on varies depending on what the practitioner believes to be advisable based on your problems. Each treatment will be different and cups can be moved around or left longer depending on the day and how your body reacts. After the treatments you may notice that your skin has turned a red or purple colour – this is normal, particularly if the cup was placed in an area that had an underlying blockage or previous injury. This change of colour can last from a couple of days to a couple of weeks but will generally not cause you any pain or discomfort. You do however have to wait until the marks have completely disappeared to begin another treatment so that the skin and blood vessels are not damaged. There are generally two main methods of cupping that are used within the treatment, those being fixed cupping and moving cupping. Fixed cupping is exactly how it sounds in that the cups are placed onto the problem area of the body and then left there for the duration of the treatment. Moving Cupping, again just as the name would suggest is where the cups are periodically moved around the body throughout the treatment. As you can imagine with the suction technique this could be quite painful which is why your practitioner before placing any cups will massage the area with oil so that they can easily slide around when necessary. Cupping is a treatment that is not only reserved for world class athletes, it can help anyone in a number of ways. Whether you are suffering from pain, anxiety, constant fatigue, stress, cold and flu like symptoms, muscle pains, skin conditions or any other ailment, cupping is an extremely beneficial treatment. Interested in booking a cupping treatment? Contact us today on 0800 051 76 88 or fill out our contact form. We have clinics throughout the North West of England including Northwich, Ashton-under-Lyne and Salford. If cupping is good enough for Samuel L Jackson what is stopping you? 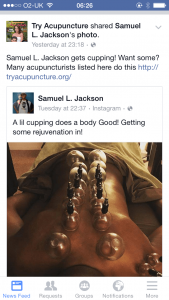 November 3, 2015 November 3, 2015 ATWAcupuncture, Latest NewsTagged Acupuncture, cupping, Samuel L JacksonLeave a Comment on If cupping is good enough for Samuel L Jackson what is stopping you? Here’s a great image from Facebook of Samuel L Jackson, yes none other than the famous actor Samuel L Jackson, getting cupping as part of his regular acupuncture session. …in Chinese medicine a therapy in which heated glass cups are applied to the skin along the meridians of the body, creating suction and believed to stimulate the flow of energy. The process is quite simple and if you’ve never had it the entire session is very relaxing. Warm heated cups are placed along the meridians of the body, typically along the back. The cup creates a vacuum which causes the skin to rise and redden and for the blood vessels to expand. The cup is generally left in place for five to ten minutes to get the full effect. The effectiveness of cupping can vary from person to person, however a study in 2012 published in the journal PLoS ONE suggests that cupping therapy may have more than a placebo effect. Australian and Chinese researchers reviewed 135 studies on cupping therapy published between 1992 and 2010. They concluded that cupping therapy may be effective when combined with other treatments like acupuncture or medications in treating various diseases and conditions. It should be noted however that cupping many be used as part of a therapy programme for lots of conditions. So what are you waiting for? If you fancy trying cupping and seeing what it can do for you and your circulation then why not call the team at Acupuncture That Works today and book in a session. Call us now on 0800 051 76 88.